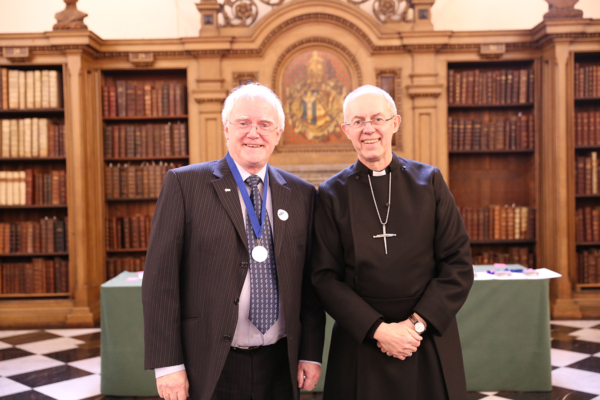 UK-based Roger Jones, composer of over 20 Christian musicals, author and speaker, has become the recipient of The Thomas Cranmer Award for Worship from the Archbishop of Canterbury in recognition of over 40 years working as a composer, evangelist, worship leader and speaker. Having studied music at the Birmingham School of Music (now Birmingham Conservatoire), Roger went on to become Head of Music at Aston Manor School in inner-city Birmingham. After a few years Roger felt the need to write music for his school choir that worked well in terms of age and ability, and he began with an Easter musical, ‘Jerusalem Joy’. This musical was featured on BBC Songs of Praise in the mid-1970s and has since been performed around the world. Roger continued to write musicals, and in 1984 left teaching to become full-time director of Christian Music Ministries. Some of his best-known works include ‘Saints Alive’, ‘While Shepherds Watched’ and ‘From Pharaoh to Freedom’. The Thomas Cranmer Award for Worship for his unique contribution to Christian music. Roger Jones, the Birmingham-based Director of Christian Music Ministries, has composed more than 23 musicals performed throughout the UK and in many countries overseas, including Jerusalem Joy, Mary Magdalene, Saints Alive, Barnabas and Greater than Gold, the story of the little Welsh girl Mary Jones and her Bible. That musical earned him the Bible Society’s Mary Jones prize in 2018. Roger has followed a distinctive path within the charismatic evangelical stream of worship. His focus has always been on writing music which is accessible by the local church and does not require complicated forces or hi-tech equipment to perform. He has always been missional – motivated by a desire to share his own, strong, personal faith in Christ, and for others to catch that vision. Roger is a faithful Anglican – a licensed Reader in his Diocese – and one who has always respected the old alongside the new – the fact that so many of his musicals use traditional hymns bears witness to this. He is also alive to the possibilities for the interplay of renewal music with Anglican liturgy – for example, at the Eucharist, interweaving hymns, songs and instrumental improvisation within a traditional liturgical framework. He has the rare gift of enabling others to discover their God-given identity in Christ through the power of the Holy Spirit and has used his musical gifts unstintingly towards this end. In 2017 he was well described at Spring Harvest as one of the Church’s game-changers. For 35 years, Roger’s gentle but powerful music ministry has made a distinctive impact in building up churches and individuals.